This approach enables us to relate processes and product in the rock record. For example, sedimentologic and hydrodynamic processes in the modern help understand the development of facies, facies belts and their distribution in the ancient strata. Likewise the chemical and physical processes that cause the geophysical properties of subsurface strata are assessed in the laboratory measurements and experiments. 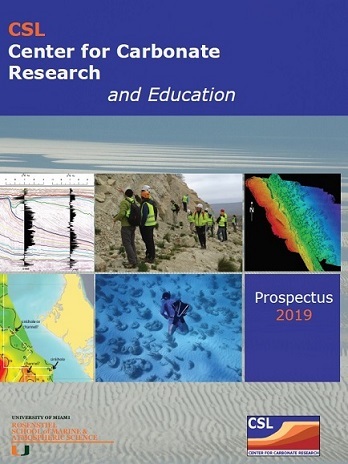 Most importantly, the integration of lithologic, seismic, log and geochemical data with sedimentologic, stratigraphic and diagenetic rock attributes provides the base for a comprehensive understanding of the rock record that can be mined to address fundamental scientific questions. In the first theme, basic scientific questions in carbonate sedimentology, stratigraphy and sequence stratigraphy are addressed. They include the role of controlling parameters such as sea level, currents, and antecedent topography on the evolution of the depositional system and its stratigraphic architecture. In the modern, we use a combination of remote sensing data, hydrodynamic measurements and surface samples to capture the spatial trend metrics of sedimentary bodies and facies belts. The relationship between process and product help understand the stratigraphic record and can be used as input parameters in quantitative geologic models. In the ancient, we use outcrop and subsurface data for assessing facies distribution in carbonate reservoirs, the relationship between the high-resolution sequence stratigraphy and sea-level changes, and fracture patterns in carbonates. The major objective of the geophysical projects is to image the subsurface strata on all scales using ground penetrating radar and high-resolution seismic surveys and relate these images to the rock properties and architecture for a refinement of sequence stratigraphic models, seismic inversion and fluid flow pathways in the subsurface. The petrophysical studies concentrate on the elastic, electric and hydraulic properties of carbonates. They include the quantitative assessment of pore shapes and their relation to velocity and permeability. Experiments assess the controlling factors such as porosity, pressure, saturation, and mineralogy on the sonic and electric properties in carbonates.